Posted by Eddie & filed under Military/Aircraft, Mountains & hills, December 10 2009. Last Sunday I went for a walk in the Campsie Fells, starting just north of Queenzieburn and walking directly up the escarpment of the Kilsyth Hiils, going via the Birkenburn Reservoir towards the 570m summit of Meikle Bin. It was a gloomy day and the moorland of the Campsie Fells is a pretty desolate and featureless place, even though there are views towards the centre of Glasgow from the high ground. 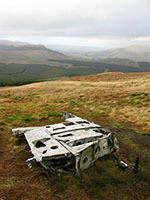 My route took me past the site of two air wrecks; a civilian Percival Prentice that crashed on the Kilsyth Hills escarpment in 1961 (see my photos of this wreck site on my website here), and a Royal Navy Fairey Firefly that crashed on the summit of Meikle Bin in 1950 (see my photos of this wreck site on my website site here). There are only a few pieces of each aircraft left at each site but they are unusual in being so close to urban areas. Interesting James, I’ll have to go back to Meikle Bin and see if I can find this other wreckage – do you have a grid reference for it? there are several aircraft part scattered all over the place, i have found undercarraige flaps, doors, light aircraft port windows, put this into google maps 56.010283, -4.148862 this entire area has scattered parts, the trees also have some scattered remains. Thanks for your very interesting comments James. If you visited the RN Fairey Firefly crash site on Meikle Bin in Easter 1951 this was only just over a year after the crash, there must have been a lot of wreckage remaining at the site compared to now. 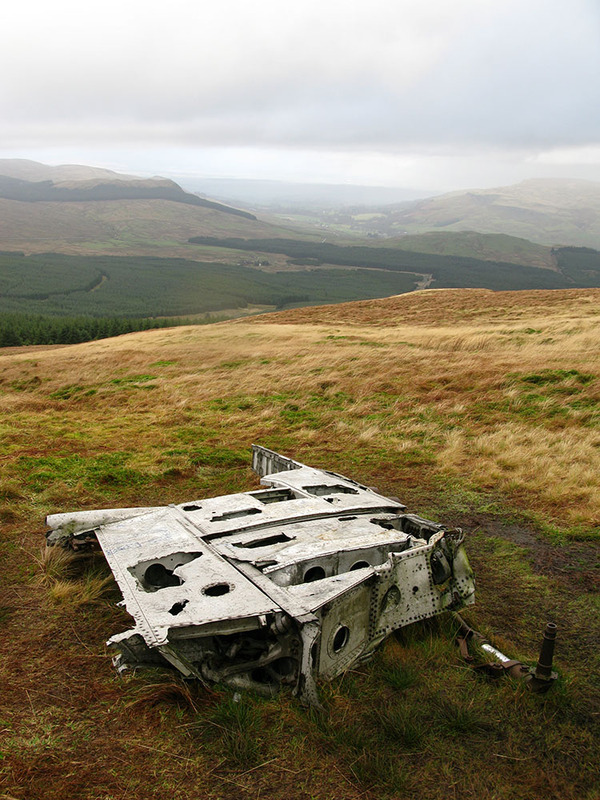 The site you mention to the west of Garrel Hill is the civilian Percival Prentice, the plane crashed in July 1961 so you must have seen the wreckage very soon after the crash, again, there is very little remaining now. I think the light plane crash you mention near Berryhill Farm was this one, that happened in November 2010 – this news article says the crash site was near High Banton, which is very near Berryhill Farm – or maybe there have been two crashes in the same field? It’s possible! I farmed the land around Townhead reservoir,my father remembered a parachute Bomb landed between Shawend Farm and Townhead Farm. It was taken away and detonated in the nearby river I’m not sure where.I also believe another bomb fell beside the railway bridge on the back road to Banton slightly to the North side of the bridge. He remembered lots of pieces of shrapnell would land in the village from the AA Guns,which the Kids would gleefully collect.